How do various safety sensors, gates, or lights fit into AIAG guidelines? The AIAG (Automotive Industry Action Group) has done an excellent job writing these guidelines. If you run any type of operation where forklifts are used in conjunction with pedestrians, they’re worth purchasing and reading. Your safety and plant operations people will be able to make good use of the guidelines. Even though they were written for the automotive industry, the guidelines are excellent for any industrial operation. Mirrors, floor striping, and guard rails. Blinking lights and the like are mentioned, and guidelines for deploying those types of safety enhancement are provided, but more automated solutions like AisleCop® forklift safety systems or motion sensors are not part of the standard as of yet. These types of automation are often used to help enforce traffic safety guidelines such as AIAG, but aren’t in conflict with it. 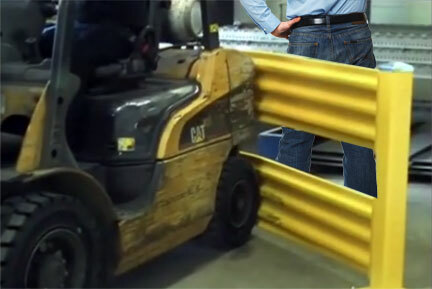 Sensors, gates and mobile lights aren’t particularly addressed or endorsed in AIAG OHS-2:2011, although this equipment is mentioned in several areas. The guidelines state that “where this is not possible, added safety controls (physical and visual) should be required to reduce pedestrian risks.” This is dependent on the site layout. It also states that these controls are not a guarantee of increased pedestrian safety (and they most definitely aren’t). The idea behind these safety systems is to help in those areas where lifts and pedestrians must mingle/cross. In part 1.5, gates are not explicitly mentioned, but help reinforce pedestrian walkways and crossing points. Some systems (like AisleCop®) help enforce “right-of-way” policies. Other gates are simple manual barriers that do not attempt to scan or monitor the aisles for traffic. Many of the areas where an AisleCop® system might be implemented are going to be the areas the guidelines describe (access doorways, limited-visibility areas, etc). Warehouse safety sensors are similar, but they can be installed in a larger variety of places, such as rack tunnel areas, etc. They obviously cannot provide a physical barrier, but may help warn pedestrians and drivers of each others’ presence. Similarly, hand rails can help by replacing visual barriers that funnel pedestrians to “designated” crossings. This also goes for visibility systems such as blue forklift warning lights. In terms of 1.2.1, (pedestrian walkways) these systems can be part of a compliant layout, but that depends on application. The size of most of these gate systems fits the 36″ minimum listed in OHS-2, so most all of these systems would work within that standard. Sensors, motion detectors, and lights are not applicable to that part of the guidelines, but can help alert people in those situations. In areas that are marked “vehicle only”, rails, gates and the like can be used to help enforce the zone’s allowed traffic. 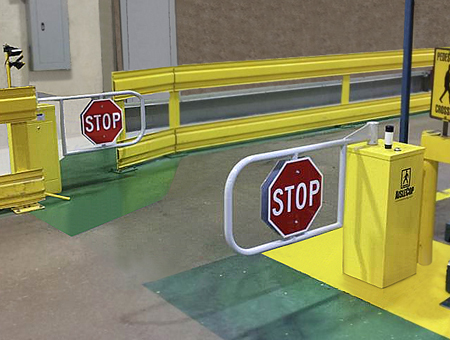 Most guard rails, gates and barriers are painted safety (or “target”) yellow, per 1.2.5 (and 12.10), or can be painted that way for purposes of safety. Also, barriers of this nature are specifically mentioned in 2.1. All of these systems can be help to “establish and identify” pedestrian and vehicle aisles (2.3), but aren’t necessarily required to do so. There is no mention of the forklift mounted light systems (like the “blue lights”) in the AIAG guidelines. They would probably most closely track with 1.3, in terms of helping to make a truck more visible. They’re not the same as the required rear facing light mentioned in the guidelines (which are more like brake lights). They’re in addition to the light and the visibility parts of the guidelines.